If there are any indications of tipping, the machine is already overloaded for that working radius. Do not back crane away from the load while carrying a maximum load; this may cause the crane to tip. It is recognized that operating mobile cranes where they can become electrified from electric power lines is an extremely hazardous practice. It is advisable to perform the work so there is no possibility of the crane, load line, or load becoming a conductive path. Insulated barriers, which are not a part of nor an attachment to the crane and which will not allow contact between the energized electric power lines and the crane, load lines, or load. All non-essential personnel shall be removed from the crane work area. Switches, if supplied, without a load on the hook at the beginning of each work shift or the first time the crane is used that shift. Inch each motion into its limit switch to ensure that two-blocking does not occur during the test. If a lift is in progress during a shift change, this testing requirement is considered to have been satisfied for the completion of that lift. However, test the limit switch again before the next lift. 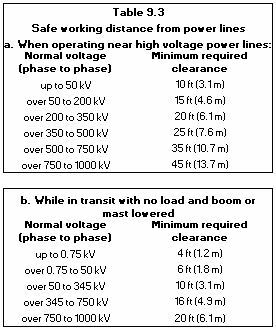 The standard hand signals for DOE use shall be as specified in the latest edition of the ASME B30 standards for the particular type of crane or hoist being used, per below directionals. Travel (both tracks) – Use both fists in front of body, making a circular motion about each other, indicating direction of travel, forward or backward (for land cranes only). For operations or crane attachments not covered by standard hand, voice or audible signals, additions to or modifications of the standard signal procedures may be required. In all such cases, the required special signals shall be agreed upon in advance by the manager, person-in charge, crane operator, signal person and riggers. These special signals shall not be in conflict with the standard signals. The hook shall be positioned above the center of gravity of the load in such a manner as to minimize swinging when the load is lifted. Leadership designation may be by written instructions, specific verbal instructions for the particular job, or clearly defined responsibilities within the crew’s organizational structure. See Chapter 2, “Critical Lifts,” for critical-lift requirements.